The Samsung TV App Store has reached another landmark this week, with news that there have now been some 2 million applications downloaded from the store. Considering that it was only in December when we announced that the app store had surpassed 1 million downloads, this shows that the idea of accessing applications through TV screens is beginning to pick up pace. 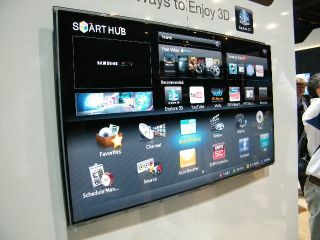 At CES 2011, Samsung showed off its latest Smart TV range to TechRadar, which comes complete with a redesigned app hub. The introduction of a 'search everything' bar means that the applications are easier to navigate – something that has been a stumbling block from TV apps. Samsung is betting big on TV apps, and there's a number of movie and social networking applications already available that have been integrated into the TV viewing experience. Having things like LoveFilm and Twitter on demand and through your TV is becoming common place and there's now even more companies adding other apps like Skype to connected television sets. As the Samsung Hub points out, it took Samsung 268 days to get to 1 million downloads and just 53 more to hit the 2 million mark. Considering 12 million connected TVs are set to be sold by the company this year, 3 million must be just around the corner.